Luke Ronchi owned the Karachi Kings in the qualifier of the PSL 2018 with a blistering unbeaten 94 off only 39 deliveries. He was a hit away from scoring only the second century of the just concluded season 3 of the PSL, but Samit Patel's unintentional edge to the third man boundary denied him that chance. 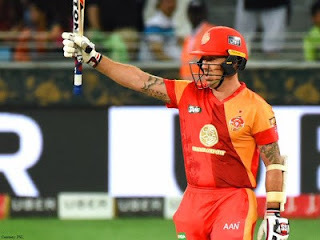 Ronchi followed up that brutal assault with another scintillating half century in the Final of the PSL against Peshawar Zalmis. His 52 came off only 26 deliveries and included 5 sixes. Ronchi owned this PSL with a tally of 435 runs in 11 matches, making him the leading run scorer of PSL 2018. He also finished the league with the highest average of 43.5 among all batsmen and his strike rate of 182.0 was second only to Darren Sammy’s 182.75 (among all batsmen with at least 10 runs in PSL 3). Ronchi hit 24 sixes in the PSL, behind only Akmal's 28. He also hit 51 fours, which was miles ahead of anyone else. I don't think that anyone would have bet on Ronchi being the top scorer in this PSL. This new site, Premium Cricket, wrote some really good cricket betting tips during the PSL and you should definitely check them out during the upcoming IPL. Ronchi pretty much single handedly took Islamabad United to the top of the table in the group stages and then to the PSL title making Islamabad the only team to win the PSL twice. He batted like a dream throughout the tournament. He dominated all opposition and spared no one. He hit the ball better than he ever has in his career. His 94* in the qualifier of PSL 3 was an epic innings with a brutal assault on the likes of Mohammad Aamir, Usman Khan Shinwari, and Shahid Afridi, all bowlers who have typically been tough to get away this season. I don't think he has ever batted this well at any point in his career, and I am sure Ronchi will be itching to play in more league and come back to the PSL next year! PSL was average, IPL will rock this season! CSK is back into the game!